Unique island experiences, which you will always remember! Discover Pearl Island and enjoy an unforgettable day at a private, uninhabited island. Climb the lighthouse for a breathtaking view of the surrounding islands, relax on our two powder white-sand beaches and unwind in the shade with a tropical cocktail. 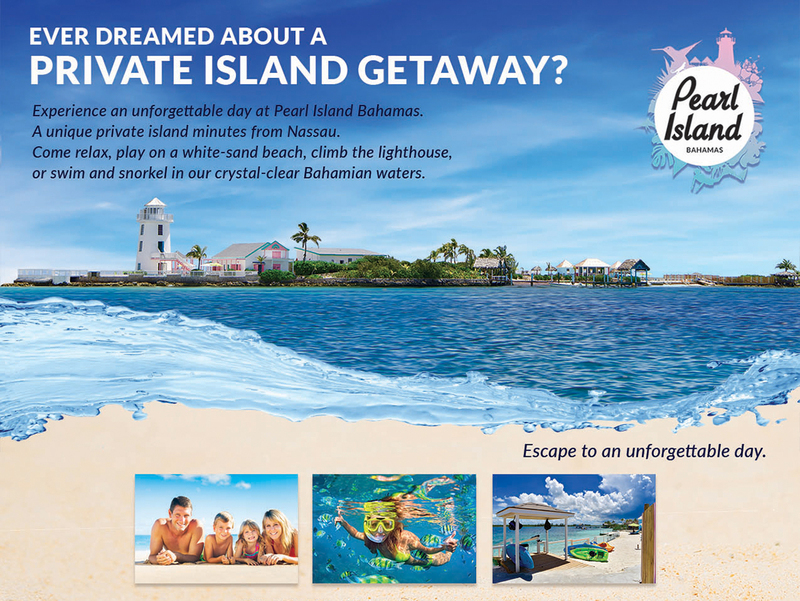 Your time on Pearl Island also includes a delicious Bahamian served lunch including BBQ Chicken, Fish Fingers, Peas n’ Rice and Coleslaw with your choice of water or lemonade. Get your mask, snorkel, vest and fins and head to a nearby protected reef within the crystal-clear waters of the Bahamas - less than 50 feet away from the island. Spend half an hour on a guided underwater adventure, discovering vibrant marine life just below the surface. Round out your day with a paddle on a kayak or stand-up paddleboard, explore the fun waterpark and take one last dip in the warm crystal-clear Bahamian waters before catching the ferry back to Nassau. Join us for your next private party, group celebration, conference, meeting or incentive trip. No matter what type of group you‘re putting together, we will make your event a special and unforgettable experience. Enjoy the amazing locations at Pearl Island, the breathtaking 360 degree ocean views and exceptional service during your event. Count on our event expertise for perfection in every detail!